KIMMSWICK, Mo. (Nov. 27, 2018) – The nation’s last authentic overnight steamboat may once again cruise the rivers of America’s Heartland and Deep South. Today, the U.S. House of Representatives reinstated an exemption to allow the Delta Queen Steamboat to return to service after a decade-long retirement. Beginning in 2020, themed voyages will operate on the Mississippi, Ohio, Tennessee, Cumberland, Kanawha and Arkansas Rivers. The vessel will first undergo an extensive renovation at a ship yard in Houma, Louisiana. In 2008, the Delta Queen was forced to retire from service when her Congressional Exemption from the 1966 Safety at Sea act expired. The law intended to prohibit ocean-bound vessels from carrying overnight passengers unless completely made of non-combustible materials included the Delta Queen, even though she was never more than several hundred yards from shore. Congress approved nine exemptions over four decades to allow the Delta Queen to continue operations until 2008. The vote today completes a decade-long legislative effort to renew the exemption. Once signed into law by the President, major repairs will begin to allow the Delta Queen to return to overnight service. “On behalf of all of us at The Delta Queen Steamboat Company, we would like to thank our past passengers, supporters, crew members and law makers who did not give up on our efforts to save the Queen,” said Martin. For more information about the Delta Queen and upcoming cruises, go to www.DeltaQueen.com. The Delta Queen Steamboat Company was founded in 1890 and originally known as The Greene Line. The company is made up of several long-time supporters and former employees of the Delta Queen steamboat. 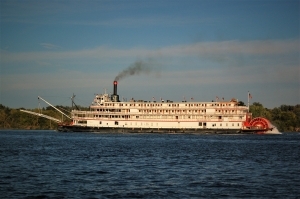 The mission of the company is to preserve, restore and return the legendary Delta Queen to overnight cruise service through the inland rivers of America’s heartland.